The Team London Young Ambassadors programme, the Mayor of London's volunteer programme for schools, aims to inspire young people to engage in social action, both in their school and the local community. Unilever believe there has never been a better time to create a better future for our children; a world where everyone has enough food to eat and no child goes to bed hungry. 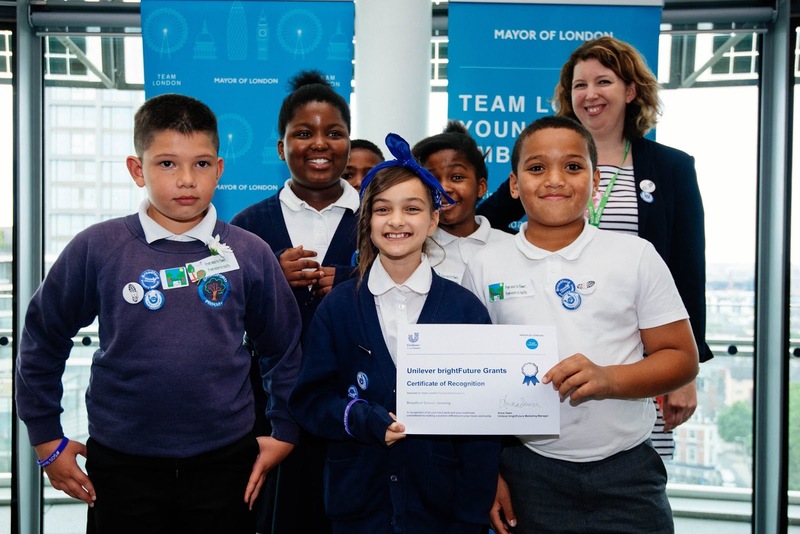 As such, Unilever created twelve brightFuture Grants of up to £1,000 for schools which have been shortlisted for the Team London Awards. 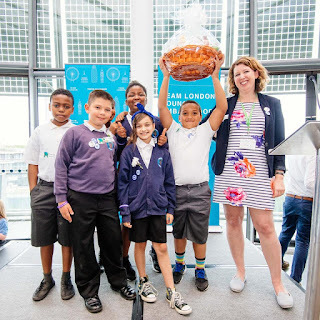 These small grants are intended to support Team London schools to do something even bigger and brighter for their local community. We were delighted when our pupils made a successful bid in December for a Unilever BrightFutures grant, which has enabled us to implement our #wearekind campaign. 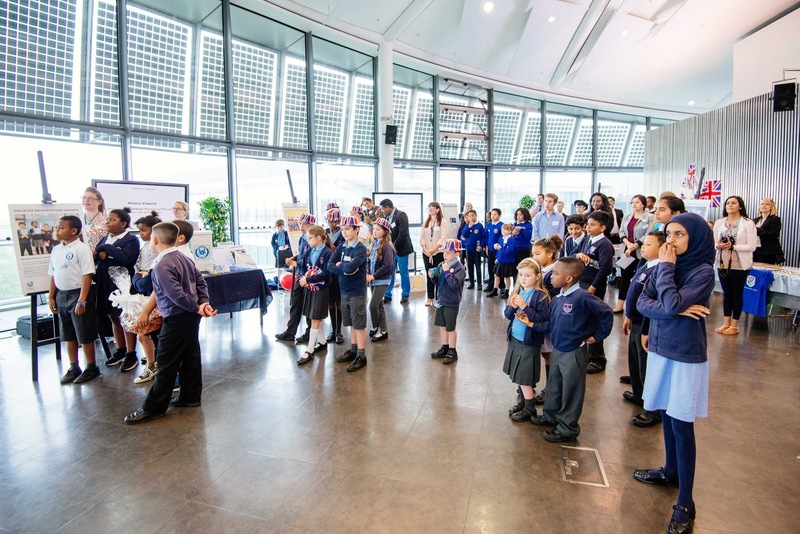 This week year 5 pupils returned to city hall to showcase their volunteering project and to celebrate their success. We are also pleased to announce that our #wearekind project and kindness revolution was voted the people’s choice for best project demonstrating the biggest impact on school communities. 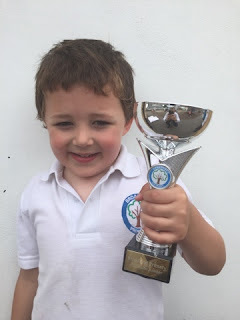 Another victory for Team Broadford! 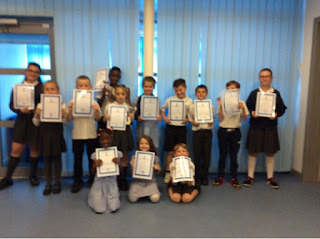 Samanyu Handoo, Caydon Buckland, Leanne Royer, Phoebe Adams, Jackie Ramalingam, Bradley Joy, Rashid Silla, Simona Raklevicius, Bobby Peek, Austin Hall, Georgie Crane, Alex Ianache, Ellie-Jo Stapleton, Javy Needroo & Teddy Pilcher: these children have all produced pieces of outstanding writing this week. Georgie Crane, Alin Botonog, Brandon Brown, Ella Nash, Jack Dempsey, Armani Peek, Weronika Harandi & Laiba Shah : all of these pupils have shown that they are making a sustained effort to improve and develop their presentation. We have four more pupils who have been extending their learning at home. 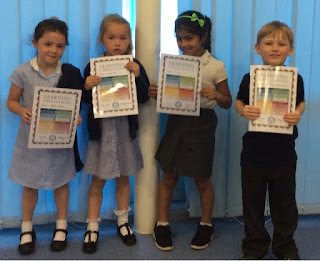 Michael, Violet, Indie and Amandeep have all taken elements of the learning challenge, completed them and bought them back into school. Thank you for sharing your challenges and well done for keeping up the learning at home. Well done to those pupils who have now achieved Free Reader status! The whole contents of the library is now open to them... so read away. 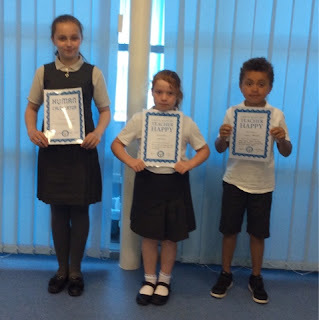 Congratulations to Caitlin, Kiera & Liam who have been selected for their hard work in class and consistently high levels of effort. Kiera has really persevered with her maths. In class she thinks about the method to use and then checks her answer. If she is stuck she will try again or use the support desk to help her. 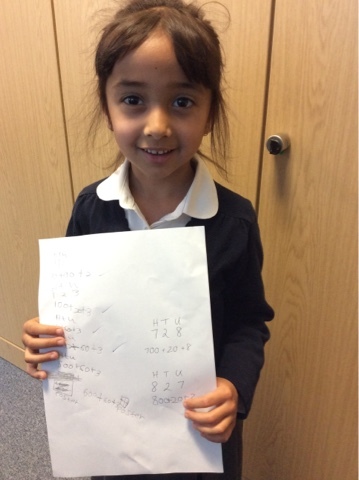 Jessica has been doing her best every day to practise with her Kumon. It involves work books that last for about fifteen minutes. The more I do it the quicker I get. It is really fun as I know my maths is getting better. Well done of your latest award Jessica. Thank you to those parents who were able to attend this morning's meeting. 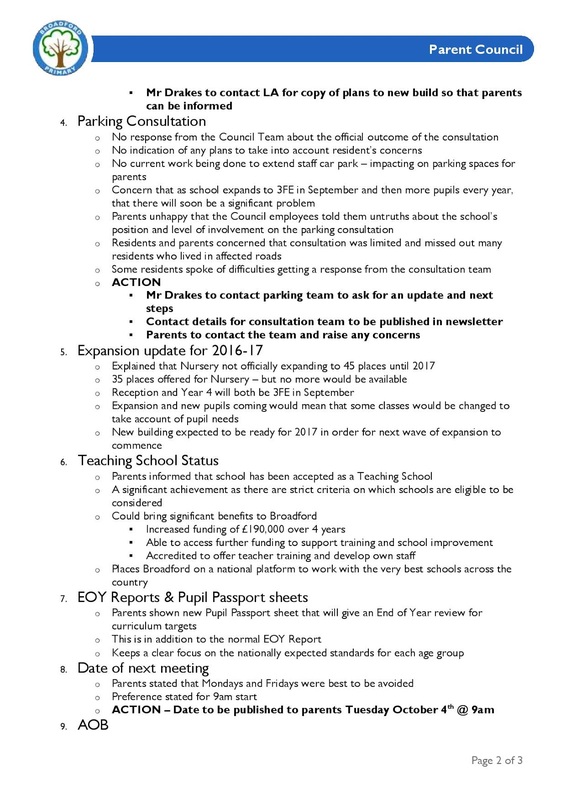 It was a very useful chance to inform you about all the key changes that have happened over the last few months. 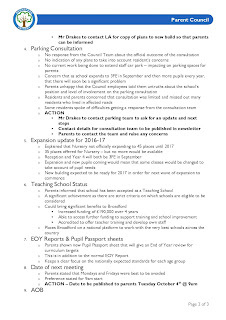 We were also able to discuss plans for the Summer and beyond so that you are aware of what is happening within the school. 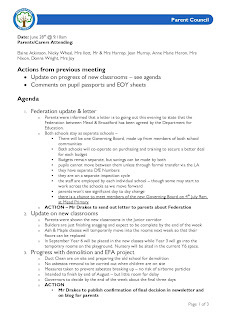 The minutes from the meeting are attached below. Rashid Sillah and Kiera Baker have both got their bookmark for 25 books! David Mills has earned his Bronze certificate. 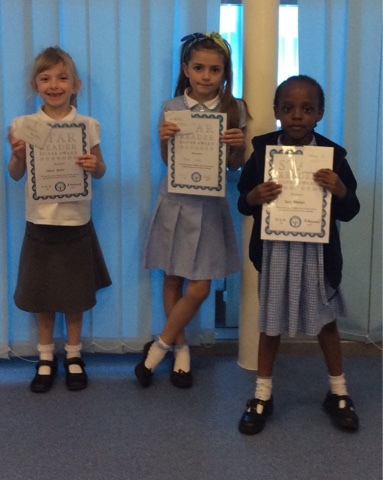 Bella Hyder, Nikola Urban, Alice Adedipe & Jessica Butler have read 50 books and received their silver certificate. Lewis Davis, Santana Coffey & Olivia Bundy have completed their Bronze tracker. Keira Baker, Yazmin Satti, Hayden Northwood, Elena Amato, Adam Abubakr, Alfie Bloy, Harry Kaylor, Emily Russell, & Joe Green are at the end of the Silver tracker. Nina Joshi has earned her Golden bookmark. Well done to Kimberley Stewart who has earned her platinum Certificate. 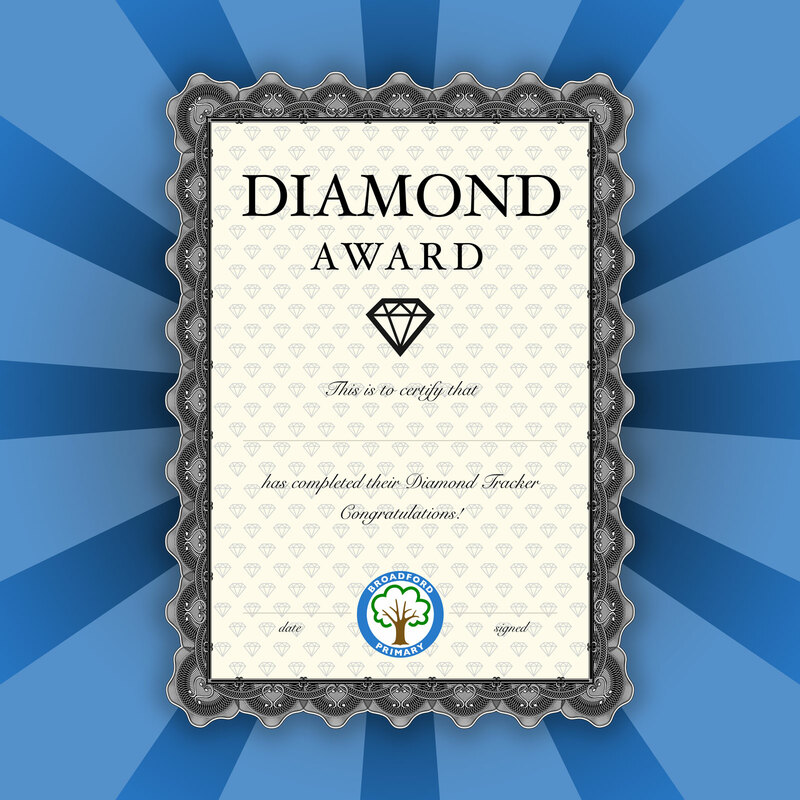 Ramone Holme-Slater & Athenkosi Nombeko have completed their Diamond tracker. Emily Claydon has earned her Star Certificate. 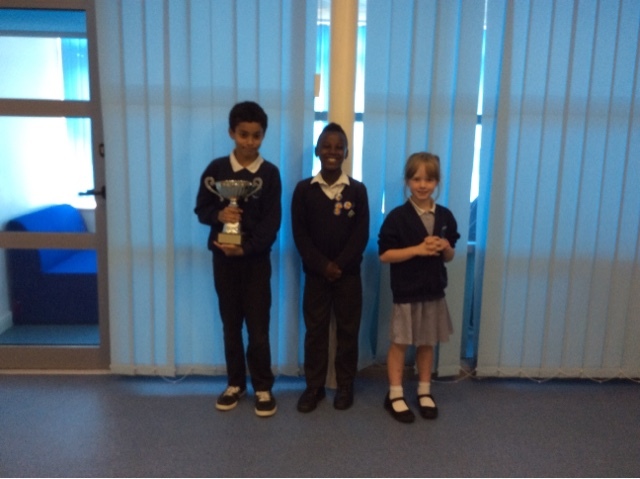 We are very pleased that Palm class have managed to top the Attendance League this week! 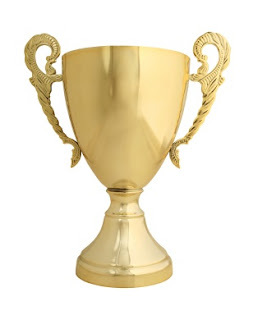 Well done for getting the overall attendance above 96%... that is much more like it! Martina Rensch, Oliwia Bartnik, Roxy Smith, Leigh-Anna Weaver, Daniel Kalusha, Mia Gallagher, Taylor Royer & Bobby Peek have collected their Golden certificate. 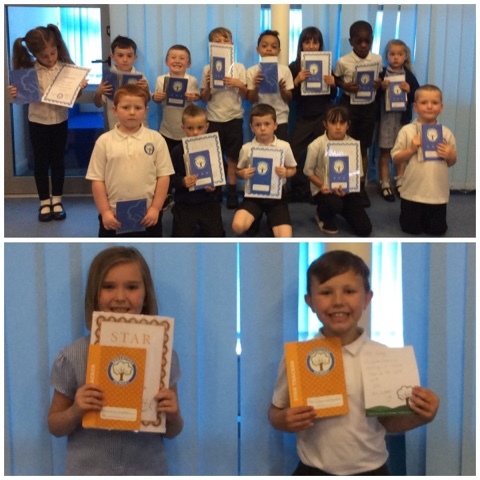 Well done on continuing to do your best in every lesson! 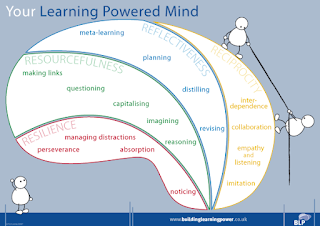 These are the key skills that our children will need to learn effectively in class and be successful later in life. 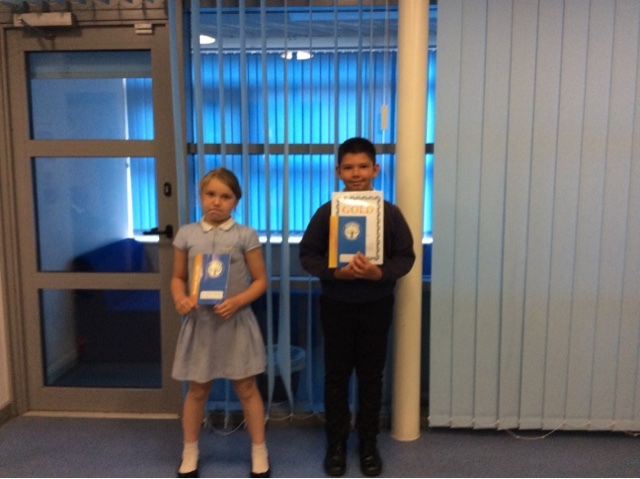 Lea Cerqueira, Caitlin Bowden, Ethan Gibbs, Michael Rack, Aaliyah Yasrin & Conner Holloway have demonstrated effective reciprocity this week – able to listen carefully, work collaboratively and take turns. Henry Cruz-Kokonchev, Hayden Northwood & Martin Wicher have shown that they can manage distractions, notice patterns and become absorbed in their tasks – well done for your Resilience certificate. Laiba Shah demonstrated how she can make links between ideas and capitalize on resources to earn her Resourcefulness award. On Monday our Year 6 pupils are off to explore the nooks and crannies of HMS Belfast. 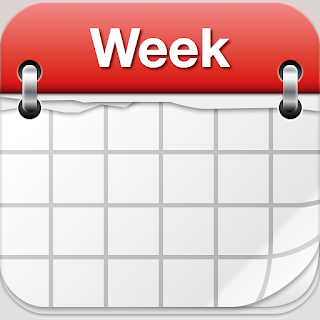 Tuesday morning is our Parents’ Forum meeting at 9.10am. We are also delighted to welcome back Grace - from Team London - who is in to work with our Y5 pupils in readiness for their celebration day on Wednesday. 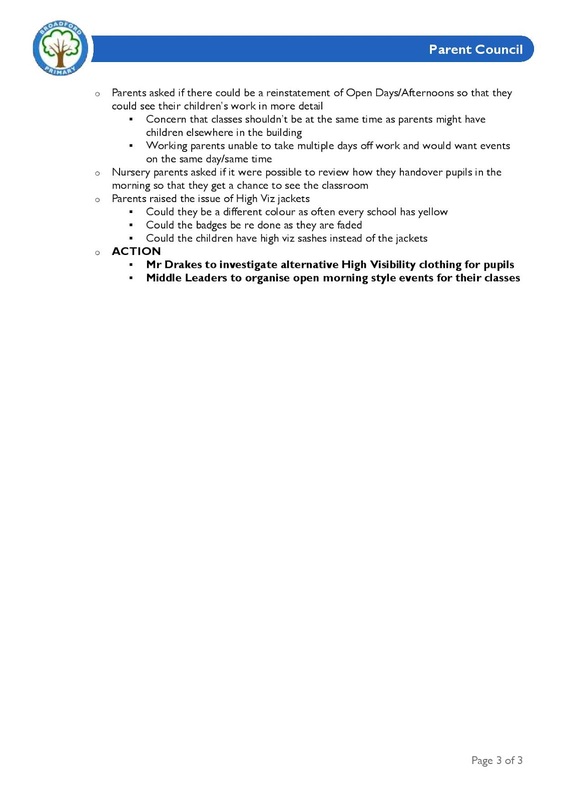 In the evening we have our Pupil Achievement Committee meeting. We have the Cedar Sharing Assembly on Wednesday and our Year 5 pupils are off to City Hall for the end of year celebration for their volunteering work. 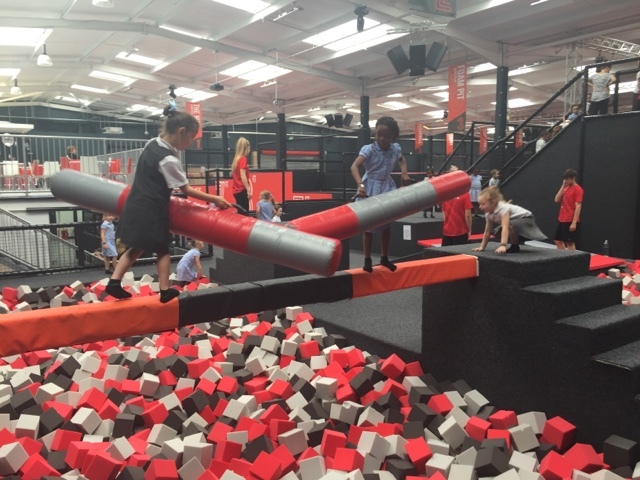 On Thursday 30th it is the Primary Sports day at Drapers, our Year 5 pupils are going to the ‘Make the Future Event’ at the Olympic Park and we have some pupils taking part in a WE Day march in London. We close the week with the Hall Mead Maths Quiz and our Cycling Club after school which is led by Phil. We are delighted to welcome the parents of pupils in Cedar class for their Sharing Assembly. This will start at 9.10am. We have now met with the Borough regarding the demolition. As you can see they have not wasted any time in getting started. 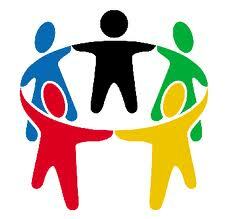 Now that we are aware of the details we’d like to fix a date for the next Parent Council meeting for Tuesday 28th June. 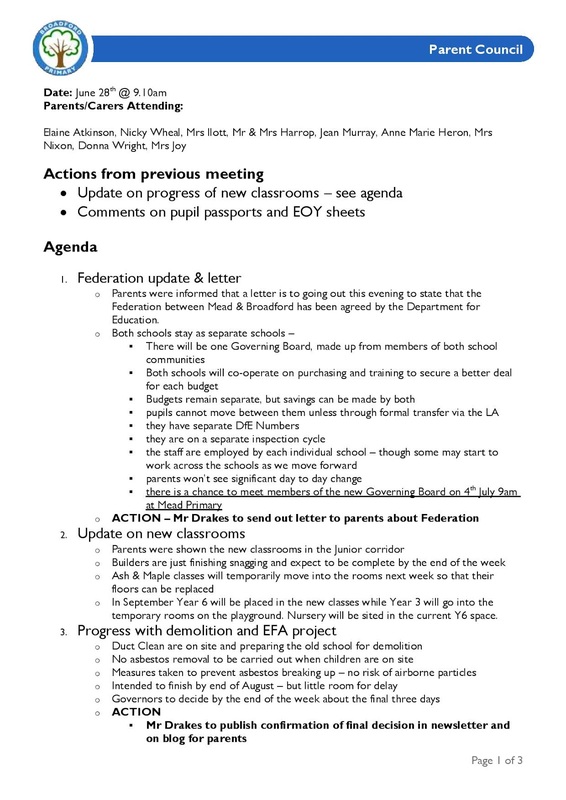 It may seem late but we have been waiting to get confirmation of: Teaching School status, demolition, Federation and plans for rebuild. Please remember that all parents are welcome to attend this informal meeting. You do not have to be a member. 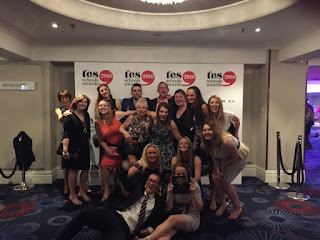 We were delighted to be chosen as the Community and Collaborative School of the Year 2016 at the recent TES School Awards. It was an honour to be able to promote the hard work of Broadford pupils, staff and Harold Hill groups and families. All of them have contributed significantly to our school's development over the last five years. 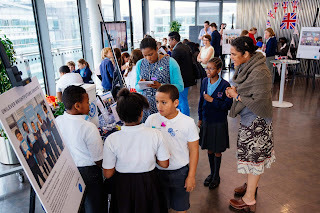 Our vision specifically refers to the importance of the school championing the local community and ensuring that Harold Hill engages far afield as well. We have relentlessly tried to give our pupils and families a wide range of opportunities to broaden their horizons, to make them realise their potential and be inspired to achieve great things. Thank you for all the kind comments, support and encouragement. It was recognition for us all. The original bid is below and shows the incredible achievements we have had this year. 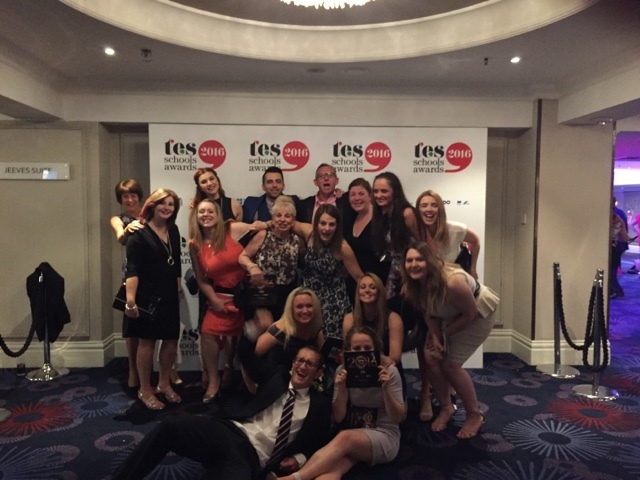 Well done Team Broadford! 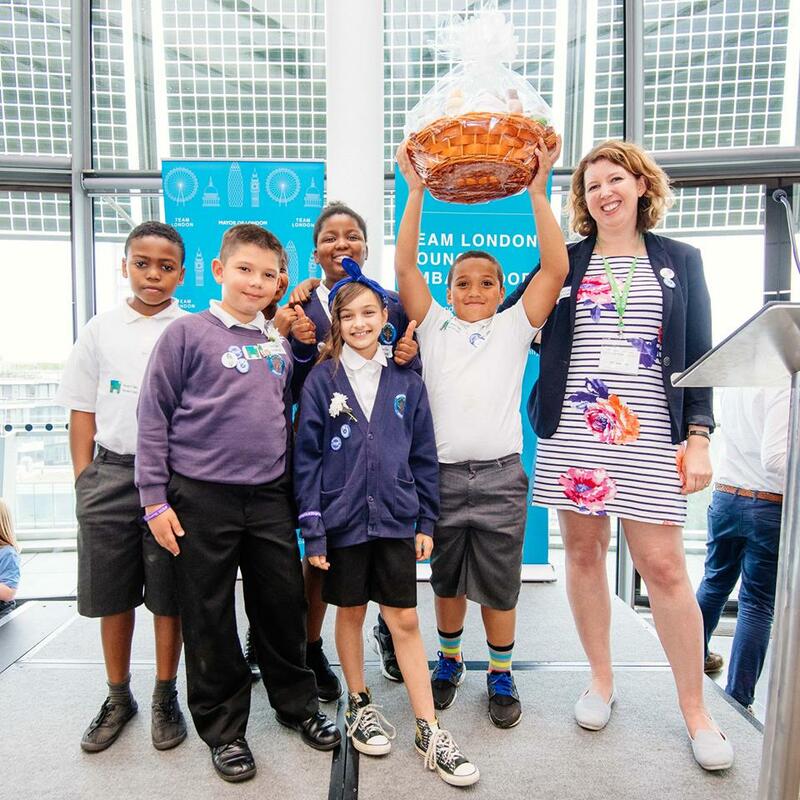 Our partnership last year with the Mayor of London and Free the Children is deserving of this award for the way it has had a direct and positive impact on our local community and inspired a new generation of social activists. We set up Team Broadford to encourage all pupils to give up their time to make our community a better place. 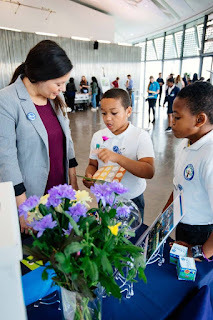 The aims were to inspire the next generation of volunteers, connecting pupils with our community and give pupils the skills and experiences they need for future success. Through this volunteering programme the pupils have independently developed a range community projects on social issues they are passionate about. Visiting pensioner clubs and care homes to spend time with vulnerable elderly people. In addition to this, Team Broadford Volunteers created and pitched a campaign idea to a panel resulting in them being awarded a Unilever bright futures grant. 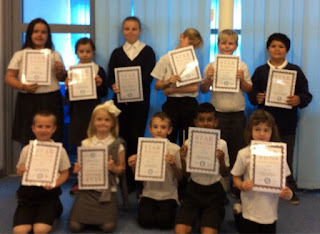 The pupils described how they believe that everyone deserves a little kindness in their life. This project aimed to kickstart a kindness revolution and launched a ‘year of kindness’ with their campaign #wearekind. The grant has enabled us to buy coats for people who are cold, flowers for people who are sad and snacks for people who are hungry within our community. 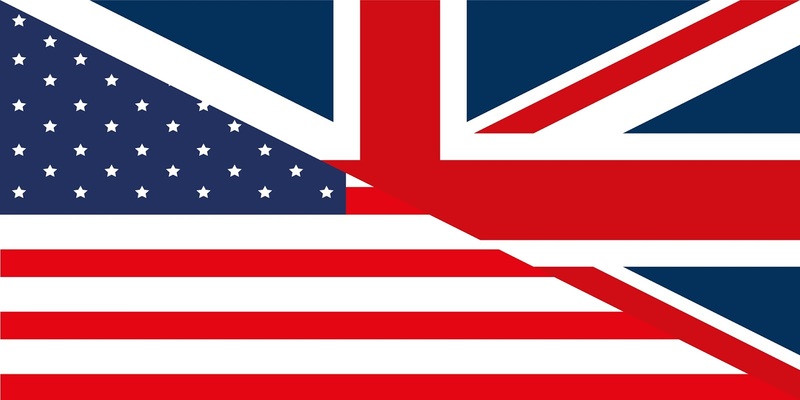 Team Broadford volunteers live the ethos of Morgan Freeman, ‘How do we change the world? One random act of kindness at a time.’ Throughout our year of kindness we measured the impact on attitudes, behaviour and academic success of all stakeholders. Within the school, those who sign up to become Team Broadford volunteers (76% of pupils have taken part) can exchange their hours of volunteering for bronze, silver and gold certificates and rewards. These achievements are recognised with the chance to attend We Day, a global celebration of young people making a difference in their communities. 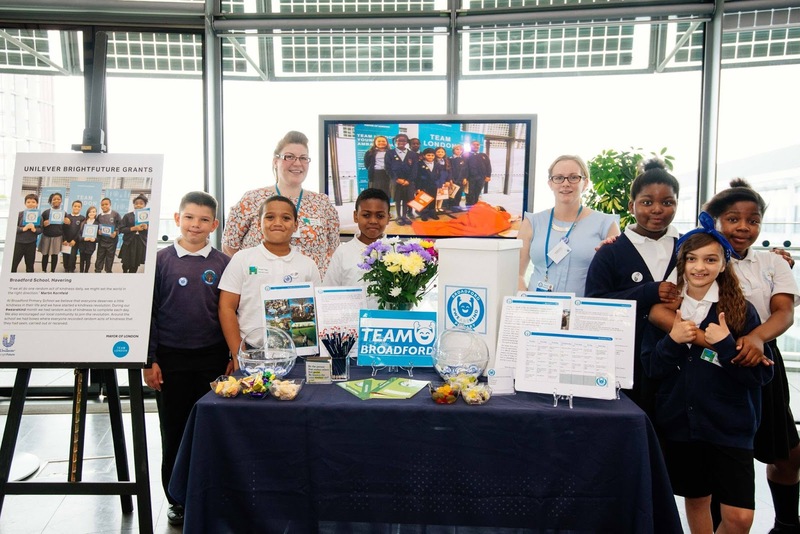 The work of Team Broadford volunteers have been celebrated at We Day and two students from the school have spoken about their community engagement at Wembley Arena in front of 12,000 spectators and many more online followers. We believe that the way in which this collaboration has impacted on our community is worthy of the Collaboration & Community Award. Well done to Brandon Lee Bundy. This weekend he completed a 5km run for charity. It is great to hear about how Broadford pupils are helping others with acts of kindness. Well done to Finley who has passed his first grading at Ju jitsu. 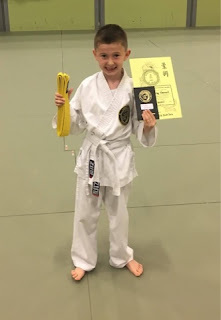 As a consequence of his hard work he has been able to gain his yellow belt. We were very sorry that we had to cancel the Broadford event. 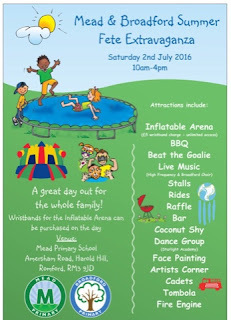 However, as part of our new partnership with Mead, we are able to offer a joint Fete on Saturday 2nd July! Please see the details below and we hope to see you there #pleasedontrain! 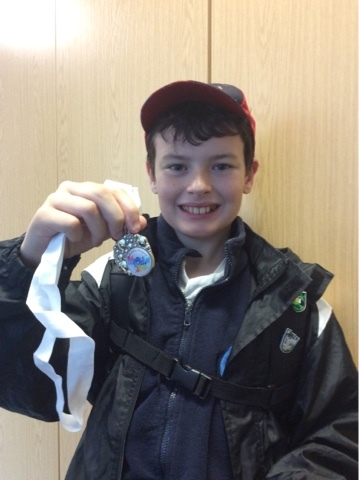 Congratulations to Charlie Porter who has achieved his Platinum Reader award! 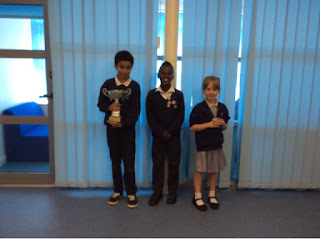 Well done for reading so regularly at home. 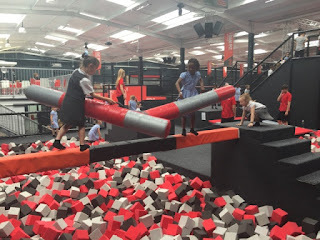 As a reward for coping so well with the trauma of the wind and rain during the beach trip, our Reception pupils spent the morning at Jump Evolution. 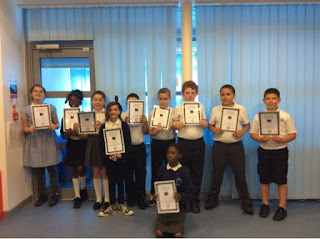 Congratulations to our latest group of Fact Hunters. Did you know that the longest known case of hiccups took 68 years to cure? Congratulations to Plamen who has completed his Gold Tracker. Isabelle has earned enough merits to collect her Bronze. 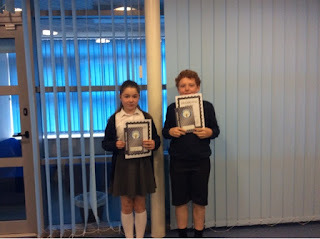 Jude and Emily have both managed to move onto Star after finishing their Diamond Award. Nina has been working hard on her partitioning in class. I can separate a number into different values. I've had to practise a lot! Well done for persevering with the task Nina and being more confident for it! Our Year 6 pupils had the amazing opportunity to meet Chelsea Flower Show Gold Medal Winner Juliet Sargeant today. Juliet explained the processes that go into creating a unique and personal garden. Juliet explained to us difficult to know where to start and the pitfalls can be daunting. For over 20 years, Juliet Sargeant has been winning awards (most recently, Gold at the Chelsea Flower Show 2016) for her imaginative solutions to complex garden problems. 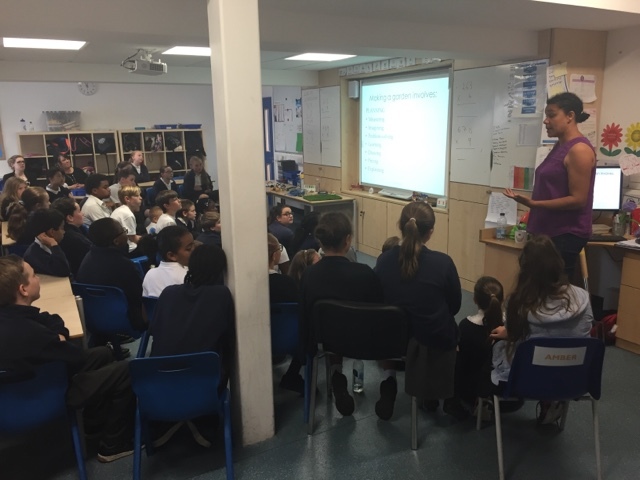 She shared her knowledge of design & the experience of construction with top tips on how to make a success of a garden project. Juliet was a plant expert. She explained to us exactly which plants will suit different conditions. I didn't realise that it all took so much planning and skill. Juliet also took the time to explain the meaning behind her award winning garden from this year's show. 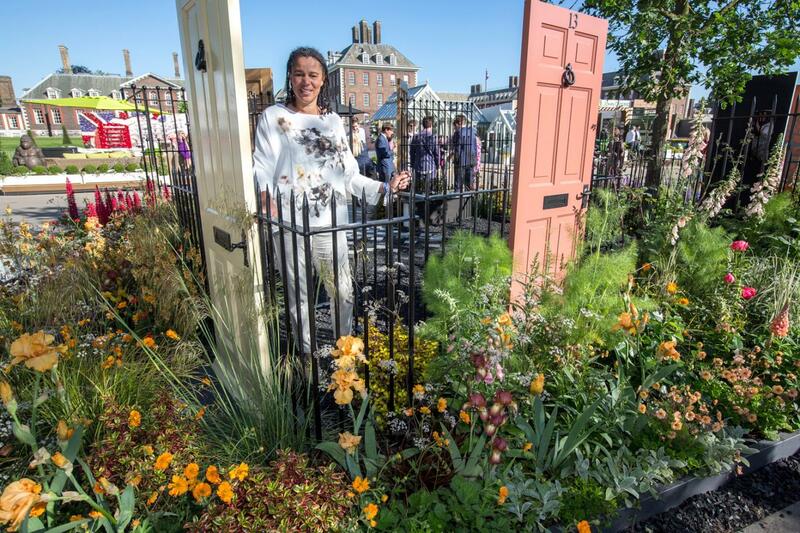 As the first black landscape designer to create a garden at the Chelsea Flower Show in its 103-year history, it was an even more amazing achievement to be awarded a gold medal. Juliet Sargeant, 50, hopes the success for her Modern Slavery Garden will help spur a huge increase in diversity in horticulture “within five to 10 years”. Daniel had to run for 5km because he wanted to raise money for bibles. He was collecting money on behalf of Romford Salvation Army. Daniel received a free Bubble Rush white t-shirt (amongst other Bubble Stash) to wear as he ran around the course. 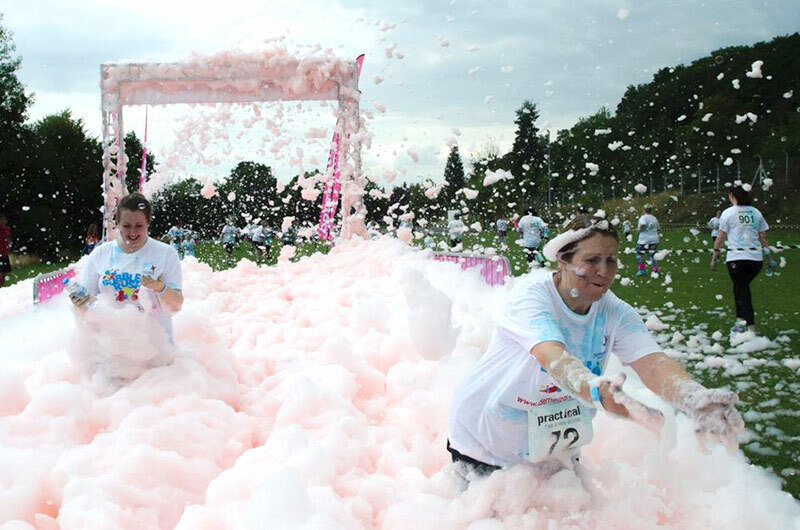 Bubblers (participants) were set off in waves of 150 to tackle the run and a huge amount of bubbles. On each Bubble Station there were high powered foam cannons blowing out 30 cubic metres a minute of frothy milkshake bubbles. I really enjoyed the event. So far I have collected quite alot of money for the church! Thank you to all the volunteers who helped to man the stalls at the recent Fathers' Day sale. We are delighted to announce that over the two days the stalls took £283.53! 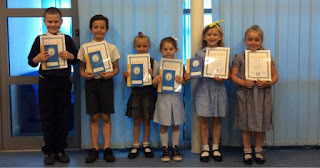 Congratulations to our weekly award winners. 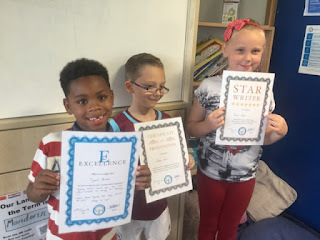 Leah was the Star Writer in Cherry, Tyrell collected the E for Excellence award and James has worked hard to develop his presentation skills. We are very sorry to announce that this year there will not be a FoB Summer Fete. The organisers have been working tirelessly to put all the arrangements in place. However it is clear that the demolition preparations are going to make it impossible for the day to go ahead. 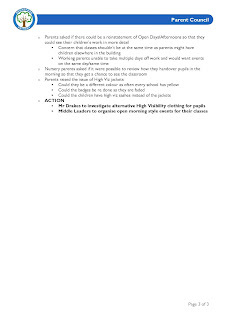 Because the construction site needs to remain secure, there is extremely limited vehicle access to the rear of the school grounds - with the exception of emergency vehicles. Without regular access it would be impossible for the stall holders to enter and exit the site. We will be looking to move all the already agreed stall holders to Mead Primary, and we will publish the details of their fete so that you can choose to go there instead if you wish. Mark Borrell - Chair of the FoB - is very sorry for the late cancellation. His team have put in lots of hours already, but it was a clear decision to make once we had met with the Borough and Construction team. 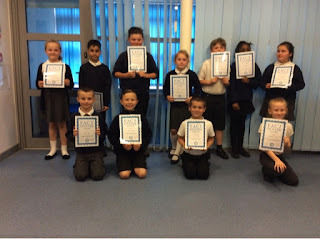 During the recent poetry festival, Hilldene Primary performed a poem by Carol Ann Duffy - F For Fox. It was quite hard to perform because of all the alliteration. But I loved the idea of a fox going to a fairground! It reminded me of Fantastic Mr Fox... he escapes the farmer and manages to feed until he is full. fluttered out of his mouth. had broken his fast with a feast of fowl! flicked a fiery fag at the fox and the fox foxed off. forcing his furry features into family bins, filching thrown-away food. Thief fox, friendless fox, thin fox. and forlorn feathers floated away on the frosty air. This week Broadford & Mead pupils joined together to perform a poem for the Harold Hill Poetry Performance. The theme of the week was 'Animals' and their poem was about the hyena. A strange, ragged animal of the plains, it has a poor reputation. 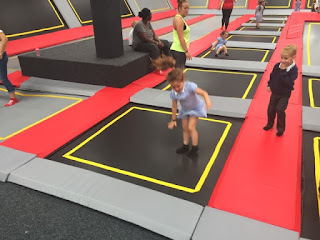 However the children bought the creature to life brilliantly with their physical expressions and clear voices. Harry Hann, James Wise, Adam Murray, Ayomide Otegbola, Fabian Cacaj, Katrina Weaver, Mervyn Vumuka & Ella Mae Wall: all of these pupils have shown that they are making a sustained effort to improve and develop their presentation. 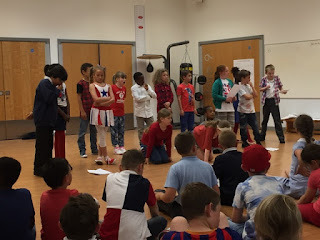 Our pupils spent the week learning some interesting and unusual poems ready for the performance. However it was also a chance to research some incredible stories. Have you ever heard of 'The Great Bed of Ware'? 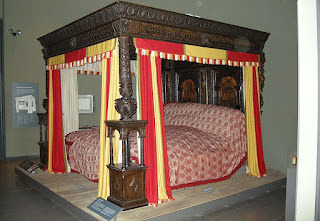 This was an extremely large oak four poster bed, carved with marquetry, that was originally housed in the White Hart Inn in Ware, England. I found out that it was built by Hertfordshire carpenter Jonas Fosbrooke in 1580. 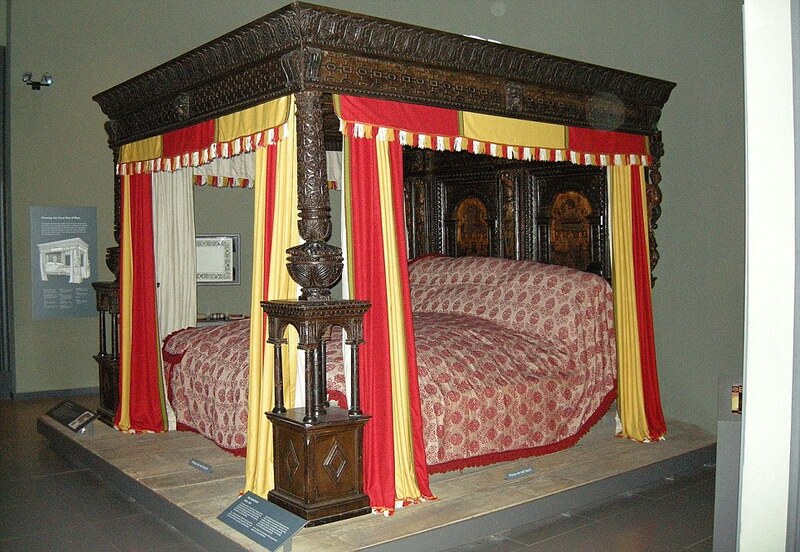 Amazingly the bed measures 3.38m long and 3.26m wide. Apparently at least 8 people could sleep in it at once. The idea was that lots of people who travelled in England at that time wanted somewhere quick to rest. They wouldn't have a room each, they'd just share the bed. The poem is an imaginative take on what it would have been like to spend a night in 'The Great Bed of Ware'. If you want to see it for yourself, go and visit the V&A Museum. 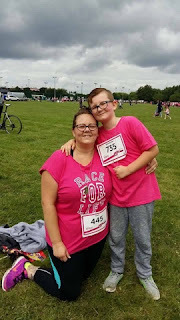 Well done to Santana Coffey who has completed her Bronze Tracker. Emily Claydon, Alfie Bloy, Adam Abubakr and Kimberley Stewart have both earned their Silver award. Plamen Vasilev has earned enough merits to finish his Golden Tracker, while Suada Cacaj has now completed her Platinum. 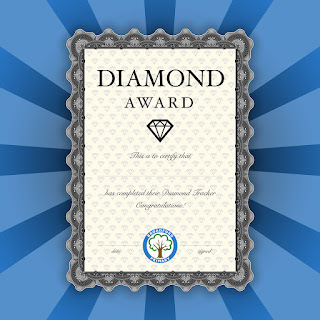 Jude Gore & Emma Bloy have now finished their Diamond and are onto the last stage of the journey... Star! 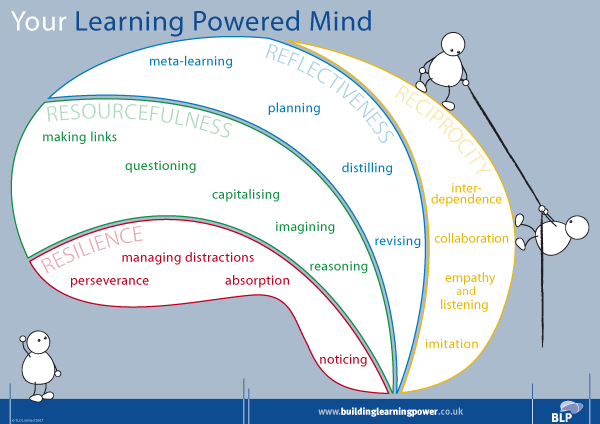 We have been blown away by the children’s enthusiasm for learning. There is an incredibly welcoming and positive culture in the school of which you must be very proud. Everyone was so happy to talk to us, share ideas and show us their work. We now hope to continue the link with Broadford and get our pupils connected when we return home! It is our aim to make a real ‘dent in the universe’. 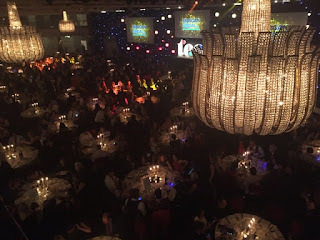 Broadford Primary will now be talked about in staffrooms thousands of miles away… a very notable achievement! 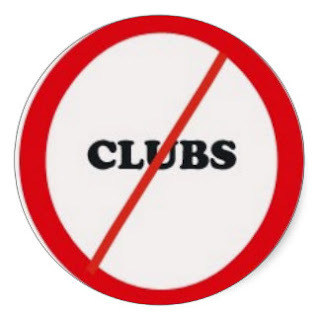 Due to the closure for the EU Elections and the early finish for the TES Awards there won't be any clubs on Thursday or Friday.